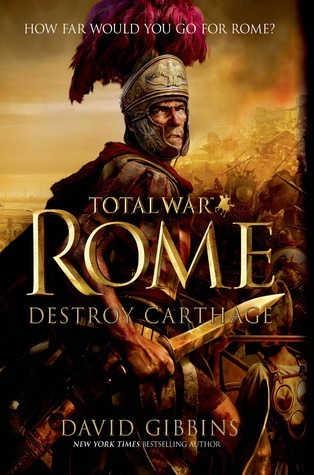 Inspired by PC game Total War: Rome II, Total War Rome: Destroy Carthage is not your typical Roman historical novel. For one thing, it is written by an author of superior archaeological thrillers or adventures, David Gibbins, who has an indepth knowledge of several maritime archaeological sites, including Carthage, having taken part in excavations himself. His thrillers are characterised by their detail and their authenticity. All right, they might make certain fantastical elements their target, such as Atlantis, but I’ve found that these novels are very much about the journey or process of discovery rather than the destination. This was especially evident in the latest published this year, the superb Pharaoh, one of my top ten books of 2013 for sure. No historical or military detail is too small or uninteresting and in Destroy Carthage Gibbins turns that talent to Rome. Total War Rome: Destroy Carthage is intended for PC gamers every bit as much as fans of historical military fiction. Plenty of us have lost hours to the addictive Total War games and here we have the bones of the final Punic War (148-146 BC) laid bare. Instead of dramatising the events that led up to Scipio Aemilianus’ apocalyptic assault on Carthage, Gibbins presents a series of events which defined Scipio’s career and ensured that Scipio would never be diverted from his destiny – to destroy Carthage once and for all, finishing what his adopted grandfather began with his defeat of Hannibal, and wiping Rome’s great rival off the face of the earth forever. Battles and their soldiers are no more important here than the tactics and strategies that dictated their use or led to their happening. Through following Scipio’s career, commented upon as it is constantly is by his friend the great Greek historian Polybius, we are led through Rome’s cursus honorum, Scipio’s pathway to power in Rome, as well as the mos maiorum that guided Scipio’s character. In contrast to Scipio and his faithful friend and servant Fabius, who is arguably our main companion through the novel, we have men who turned their backs on Rome’s moral code of honour, such as Metullus, who put Rome’s survival under threat. The fact that Metullus is Scipio’s rival in love doesn’t help his standing in the novel. The honourable and the dishonourable struggle for ascendancy in Rome during a critical phase of its military development. Throughout the novel, Gibbins describes in the most meticulous detail the historical background to the conflict with Carthage – the events of Hannibal’s defeat dominate everything about this book, events and people. He also covers military tactics, weapons, innovations, honour as well as the need for Rome to develop a professional army, always a motivational steer for Scipio. In places, Destroy Carthage reads like a classical war manual. In other places, it is the story of how one man, Scipio, becomes utterly obsessed by Carthage. Everything in his life builds up to the events of a few bloody days on a north African shore. The novel is very violent in places. Rome here is not familiar, not to us and possibly not even to later Romans. Scipio is as bloodthirsty as anyone else. Nothing is more important than the code of honour, however inhuman or at fault it may seem to us at times. Likewise, the fearsome Hasdrubal appeals more lion than human and is absolutely terrifying. The progress to Carthage’s annihilation proceeds through a series of episodes, most of which we see through the eyes of Fabius. The end, though, is always in sight. This wargames feel to the novel, which never leaves it (characters even refer to it), may not be to every reader’s taste. In David Gibbins’ earlier novels I found that his habit of making characters stand still and discuss facts, even when they are required to commit to urgent action, mildly irritating. In Destroy Carthage this is even more apparent but it is more in keeping with the wargames manual style. The action here is slightly removed from reality. No character is more than two dimensional, although Scipio and Polybius are fully realised as historical figures. They often speak as if they are reciting the rules of Roman warfare or describing its latest techniques and innovations, or the layout of a town or the topography of a battlefield, or the role of Rome in an ever growing world. This style doesn’t lend itself naturally to a fast flowing piece of historical fiction. It is most certainly unusual. But because this is almost a classical war manual for gamers it is effective, albeit a little tiring after a while if you like your Roman military historical fiction more conventional. More tiring are some of the repetitions in phrase and content which became more noticeable to me after a while. Destroy Carthage is not a long book and so its odd style didn’t outstay its welcome for me. And it is addictive. The obsession that drives Scipio on and the threat of the monster that is Carthage made it a compulsive read. One of the most pleasing aspects of the novel, though, is that it taught me so much about this campaign and brought the streets and harbours of Carthage to life in the most intricate of detail. The final two sections of the book are breathtaking and quite shocking. The mix of sentiment and ruthlessness is intriguing. We get hints here of the rise of the Julius Caesar dynasty and there is a very strong sense that we are witnessing the origins of the Roman empire. This is such a fascinating period in Rome’s history and after reading Destroy Carthage I want to find out much more about it. If you want to read about Hannibal, I recommend the novel Hannibal: Enemy of Rome by Ben Kane. This entry was posted in Historical Fiction, Review, Roman and tagged Historical fiction, Rome on September 1, 2013 by Kate (For Winter Nights).